The former bingo hall in Girvan. Residents in Girvan are demanding action on a former bingo hall which they say is in a dangerous condition. The hall in Dalrymple Street, Girvan has fallen into disrepair over the past few years. Responding to complaints from residents adjacent to the hall last year South Ayrshire Council’s building control and environmental health department wrote to the owners asking that they secure the building and make it safe. However residents say the hall is still not secure and is infested with pigeons, bird droppings and flies. Girvan Town Team has now requested council officers and the owners, property development company Oliver Fattal, attend a special meeting with residents. Resident Gus Kilgour said: “The hall is worse than ever. I’ve never seen a mess like this, bird droppings, flies, muck and moss and there are hundreds of pigeons roosting there. The residents are totally fed up. “I won’t be paying any rates until something is done about it. Councillor Alec Oattes said: “Council Officers appear to be bound by weak regulations and an inability to challenge Mr Oliver Fattal, whose Development Company owns the Vogue Bingo Hall. “At a meeting of the Town Team last Thursday evening, it was decided to invite appropriate Council Officers and owners Oliver Fattal to a special meeting in the Town House on 20th April, I am not sure who will turn up, but feelings understandably are running high with local residents regarding the pigeons, flies and general unsafe condition of this building. 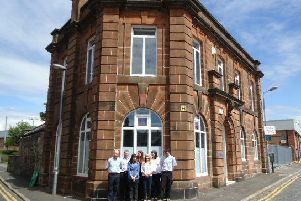 Mike Newall, South Ayrshire Council’s head of Neighbourhood Services, said: “We’ve been in regular contact with the owner, and can confirm that the building is not considered to be unsafe at this time. “As part of our monitoring process, we’ve asked the owner to start tackling deterioration of the fabric of the property, and will continue our discussions as appropriate. The Carrick Gazette were not able to contact Oliver Fattal before going to press.